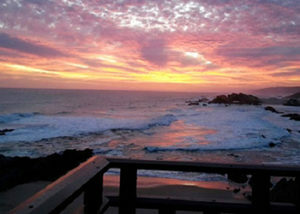 Stokkiesdraai is a privately owned self-catering beach house in Eersterivierstrand, Tsitsikamma. The house boasts ocean views in the front and mountain views from the rear and is ideally located less than 2 km from the Golf Club. The area also offers mountain hiking trails. 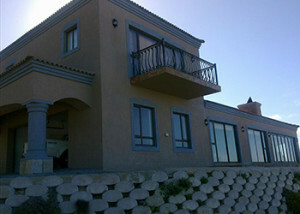 The house has 4 bedrooms and can accommodate up to a total of 8 people. There are 3 double beds and 5 single beds available. The house has 2 and a half bathrooms, featuring showers. The kitchen offers basic self-catering facilities which include a small 2 plate stove/oven combo, fridge-freezer, kettle, and microwave. A washing machine is also provided for your convenience. The living area is fitted with a dining table and a TV. There is also a selection of books and magazines available. The area is peaceful, ideal for quiet walks. The beach has various swimming spots. 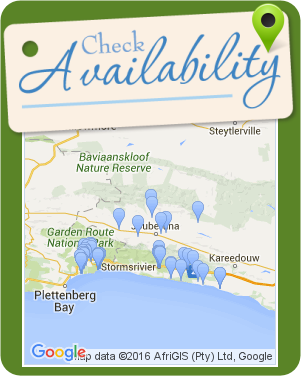 There are no shops in the immediate area, the nearest kiosk is within 8 km. 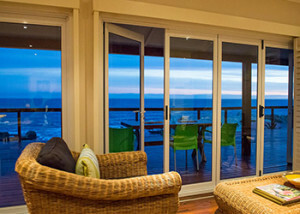 Shamrock Cottage is a self-catering holiday house situated in the seaside village of Eersterivierstrand, located in the Tsitsikamma region. 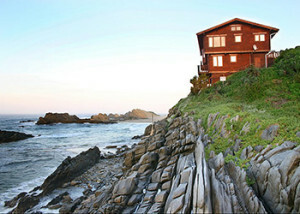 This double-storey log home can accommodate 8 persons and offers stunning sea views from the patio area. This fully furnished home comprises 4 bedrooms and 3 bathrooms. On the upper floor: the main bedroom is furnished with a king-size bed and features an en-suite bathroom; the second room is equipped with a double bed, and the third room has 2 single beds and has access to the second separate bathroom. The fourth room is on the lower level, and is equipped with twin beds and features an en-suite bathroom. The kitchen and living area are also located on the upper floor; the kitchen contains the necessary appliances to cook meals, including a dishwasher, and a washer-dryer machine. 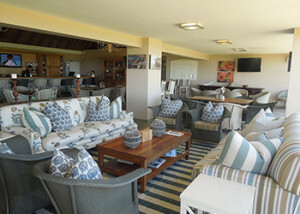 The living area also features a large fireplace, which can be used as a braai area. 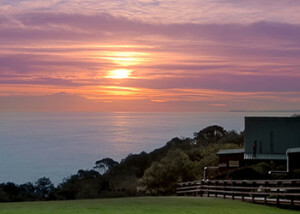 The lounge opens onto the patio, where stunning ocean views can be admired, as the house is built on a cliff. Parking is available for 1 or 2 cars in front of the house. The village of Eersterivierstrand offers a few rock pools, which is ideal for snorkelling. There are also a few fynbos paths to explore as well. 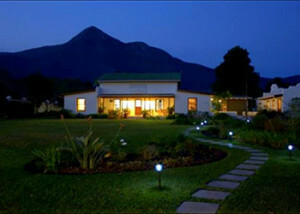 Guest Lodge on the Edge offers guest rooms and is situated near to the Storms River Bridge, in the Tsitsikamma region. 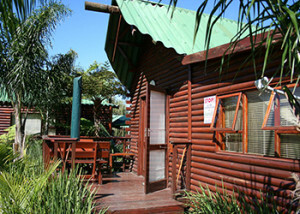 Accommodation at Guest Lodge on the Edge consists of 3 rooms. 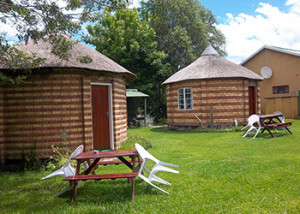 The lodge can be booked as a whole for a family as well. The rooms are furnished with either a double bed or 2 single beds and have access to an en-suite or shared separate bathroom. Breakfast and other meals can be arranged at an extra cost per person. 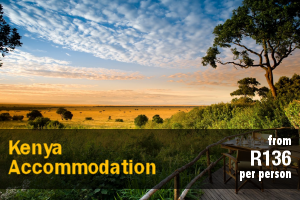 The guest house also has a communal kitchen that contains a fridge-freezer, a microwave, tea- and coffee-making facilities, a toaster, cooking utensils, plastic ware, crockery and cutlery, glassware, and braai utensils. 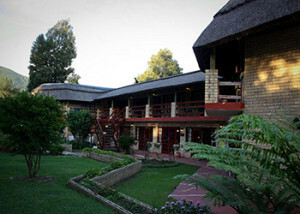 We have the Imka Trinity Retreat House that accommodates max 8 people. 2 rooms with a double bed each and 1 room with 2 singe beds in with an en-suite bath and toilet and another room with 2 single beds. There is a separate shower and toilet. 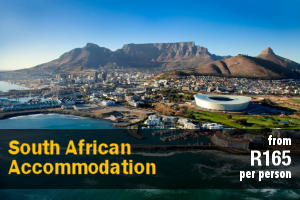 Medium open plan semi full self – catering kitchen with lounge with a satellite tv if the signal is good. 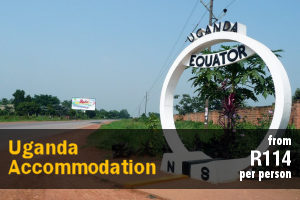 Extra small semi full self – catering kitchen also. Parking outside for 2 vehicles behind a locked gate. The Imka Trinity Retreat House splits into 2 parts with only a door that can be locked between them. 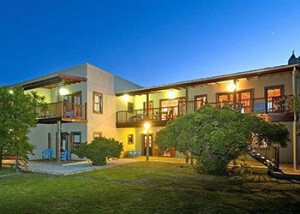 LaLuna offers comfortable living and sleeping facilities in Stormsrivier. 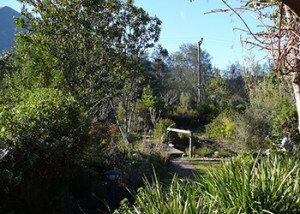 The surroundings are filled with scenery where the awakening of the Tsitsikamma forests can be inhaled. 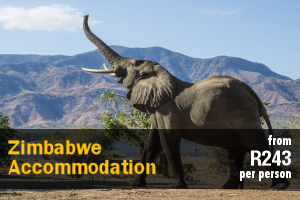 The guesthouse comprises 3 bedrooms which can accommodate 2 guests in each of the 2 double rooms and 1 guest in the single room. Saturnus has a double bed and makes use of the shared bathroom fitted with a bath, shower, toilet and basin. 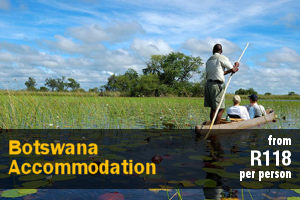 Venus has a queen-size bed and a private bathroom fitted with a shower, toilet and basin. Mercury is ideal for a single traveller and comprises a three-quarter bed and also makes use of the shared bathroom. 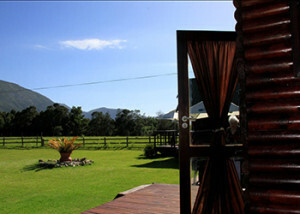 Ville Agape is set in the heart of the Tsitsikamma region, located on the Garden Route. 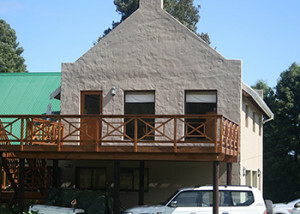 The country-style guest house offers accommodation on either a self-catering or bed and breakfast basis. 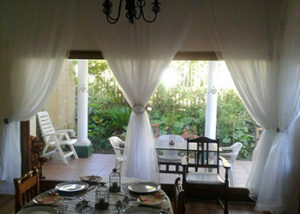 The accommodation comprises 2 units, each with a private entrance. Each unit sleeps 2 guests and contains a double bed in the bedroom and a shower in the en-suite bathroom. The units both have a kitchen equipped with a fridge, stove, microwave and tea- and coffee-making facilities. The units open onto a private patio with a seating area. Braai facilities and secure parking are available. Each unit has a TV with DSTV. 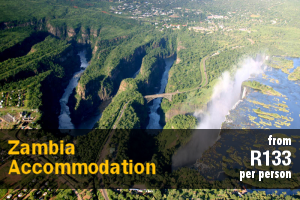 Guests can enjoy fishing, hiking, bungee jumping, mountain biking, horseback riding, 4×4 trails and kayaking in the area. Tame Alpines goats can be seen and fed on the property. 1 x Double cabin with a seperate room with double bed, kitchenette/living area with a bunk bed and bathroom. 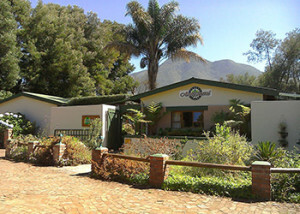 Tsitsikamma Backpackers offers a unique eco-friendly, tranquil environment situated in Stormsriver Village, surrounded by the magnificent Tsitsikamma forest and mountains. 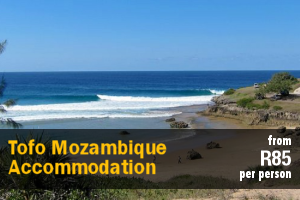 Easily accessible, just off the N2 highway and a mere 65 kilometers from Plettenberg Bay and 110 kilometers from Jeffreys Bay, on the Baz Bus route. This authentic self-catering log home overlooking the sea will tick all the right boxes for relaxation, family fun or an awesome break with close friends. 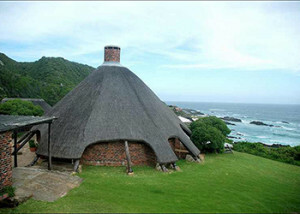 Bishops Cove is situated on one of the most unique coastal sites in the Tsitsikamma area. 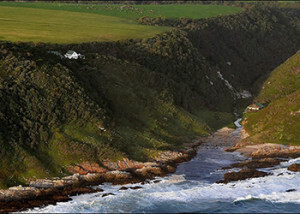 Bordering the indigenous forest and a pristine and rugged coastline with its own private little beach, guests often comment that it’s like having the famous Tsitsikamma Otter trail all to oneself. 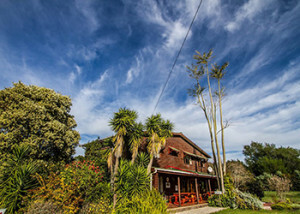 Located in the center of Storms River Village on the edge of the Tsitsikamma Forest, The Village Lodge is a 3-Star guest house for couples, families and individuals, looking for a comfortable breakaway close to a variety of action. This is Uitkyk, which quite literally means looking out. And that’s what you could choose to fill your days with when you visit this pristine piece of paradise – looking out at the breath-taking vistas of ocean, beach and sky. 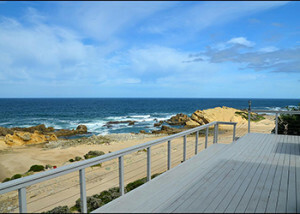 If are looking for unique and rustic accommodation, this quirky and spacious home is the perfect self-catering getaway with its outstanding panoramic sea views. 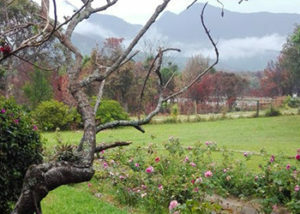 At the Woods Guest House, set in the tranquil village of Stormsriver, offers a relaxing and comfortable base from which to explore the Tsitsikamma and surrounding areas. Our desire is that guests will feel at home enough to slip off their shoes, whilst enjoying the attention to detail that the Guest House offers. 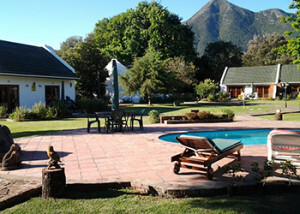 Swallows Nest Country Cottages is situated in the quaint village of Storms River in the heart of the Tsitsikamma. 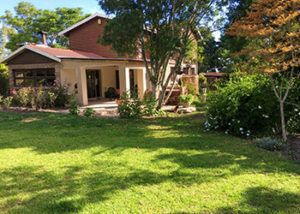 It is centrally located with easy access to all local and nearby attractions and is situated on the doorstep of the Tsitsikamma National Park. 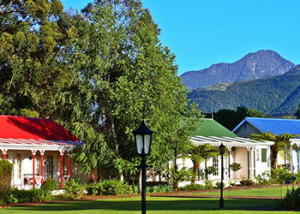 In the heart of the Tsitsikamma Forest, surrounded by mountains and with a stream winding its way through our stunning 2-acre garden, Andelomi Forest Lodge offers local and international tourists high-quality and affordable 3-Star graded bed and breakfast accommodation. 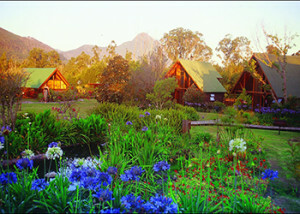 Weekend or holiday accommodation available in a meadow at the end of a road without any traffic. At the edge of a forest in an exceptional setting, quiet, out of danger, in the centre of nature and close to the beautiful Tsitsikamma National Park, Stormsriver Village. 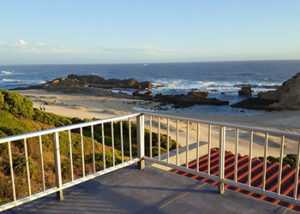 Skuitbaai is a private resort, nearest town Kareedouw, nearest resort Eersterivier, 30km from Stormsriverbridge and 70km from Jeffreysbay. 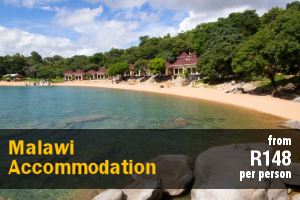 The resort has its own private beach and is situated in a security complex. Fijnbosch Camping offers spacious, unmarked tent sites that is either open or shaded. 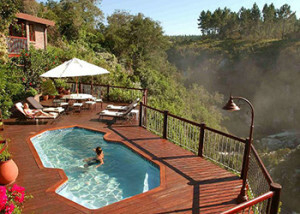 Feel close to nature with breathtaking views of the Tsitsikamma forests and mountain range. 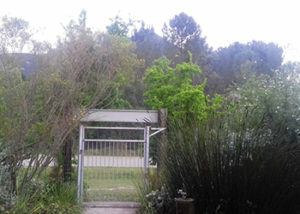 It is situated on the property of the owner, who lives in a house separately from the campsites.